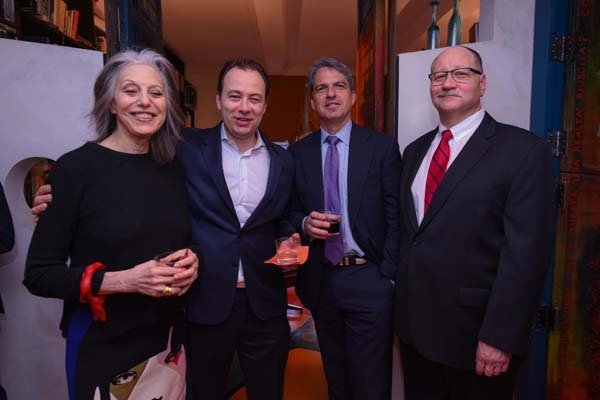 Publicolor Founder Ruth Lande Shuman hosted an intimate cocktail reception at her home to celebrate groundbreaking composer Philip Glass and Chris Ward (AECOM VP and CEO, Metro New York, and former Executive Director of Port Authority of New York and New Jersey). The two will be honored at Publicolor's upcoming April gala, "Stir Splatter + Roll". While working from the Port Authority, Ward instrumentally secured Publicolor's 2002 community revitalization project, The Painted Promenade. Students in the Publicolor program, from high schools across the City, painted a bridge on West 39th Street between Ninth and Tenth Avenues in sunshine yellow and turquoise blue. Sixteen years later, the colorfully painted walls have become a fixture in Hell's Kitchen (and the backdrop to the famed Hell's Kitchen Flea Market). This project was made possible thanks to Ward's tireless support. Publicolor's annual Spring benefit "Stir, Splatter + Roll" will be held on April 23, 2018 at the Metropolitan Pavilion at 6PM. For ticket and table information, please contact Liz Bickley at 212.213.6121 or Liz@publicolor.org or visit Publicolor’s website http://publicolor.org/events/stir-splatter-roll-2018/ to purchase tickets.